Is the SIBO breath test the right laboratory test for you? In our experience, many persons having digestive symptoms receive a diagnosis of irritable bowel syndrome (IBS), but no particular guidance in identifying possible causes, or options for treatment other than symptom management (e.g., laxatives). SIBO (Small Intestinal Bacterial Overgrowth) breath testing may be the first step to understanding your digestive symptoms, and taking action at the “root cause” level. 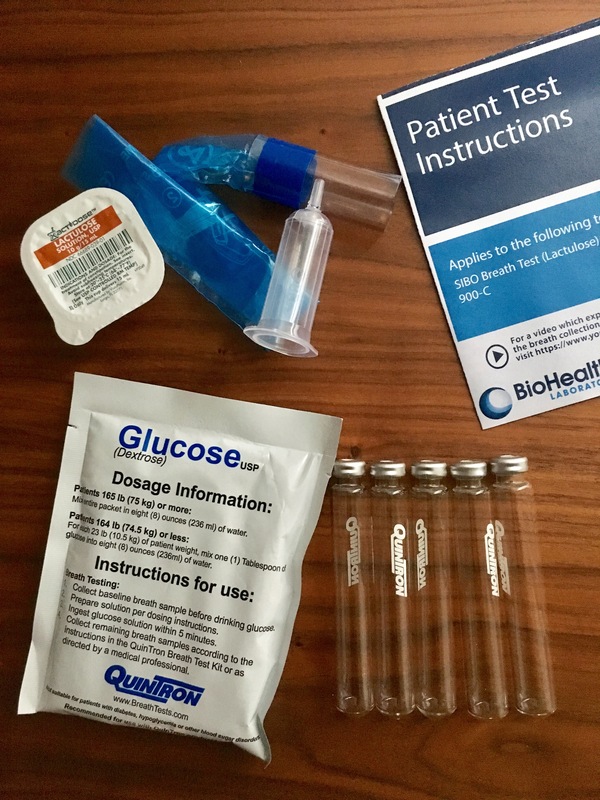 Although this test is commonly referred to as SIBO breath testing, it may also be used to diagnose carbohydrate (sugar) malabsorption. Basically: expired air is collected, and if it contains excessive hydrogen or methane, the only possible causes are excessive fermentation of carbohydrates by bacteria, either in the small or large intestine (depending on the timing of the higher than normal readings). How does this SIBO breath test compare with other assessment options? At Toronto-Centre for Naturopathic Medicine, we use BioHealth Laboratory’s test for SIBO breath testing, which is the most comprehensive option available to naturopathic doctors in Ontario. Offers testing using any combination of lactulose, glucose and fructose as test substrates. Although measuring glucose fermentation alone is more sensitive (i.e., less likely to miss a diagnosis) than measuring lactulose fermentation alone in assessment of SIBO4, measuring both offers the most accurate assessment of gut bacteria status. Glucose is completely absorbed in the first section of the small intestine4, lactulose is absorbed throughout the small intestine, including the later portion of the small intestine6 and large intestine.1 Measurement of both allows for the most sensitive assessment of SIBO the first section of the small intestine; (slightly less sensitive) assessment of the later portion of the small intestine; and carbohydrate malabsorption resulting in excessive fermentation in the large intestine. How can you ensure the most accurate result possible? Antibiotics should be avoided for four weeks prior to breath testing. (If possible), promotility drugs and laxatives should be stopped at least one week prior to breath testing. Fermentable foods such as complex carbohydrates should be avoided on the day prior to breath testing. A fasting period of 8 to 12 hours prior to breath testing. Smoking should be avoided on the day of breath testing. Physical activity should be limited during breath testing. Discontinuation of proton pump inhibitors prior to breath testing is not necessary. What is the procedure for SIBO breath testing? This test is conducted at home with a provided test kit. Beginning 24-hours before beginning the testing procedure, the specified diet must be followed. Beginning 12-hours before beginning the testing procedure, the patient must fast. A baseline breath sample is collected. The glucose, lactulose or fructose mixture is consumed. Breath samples are collected every 15-minutes following mixture consumption until all 9 to 12 vials are filled (135 to 180 minutes, depending on test conducted). Consider this laboratory assessment if you have been diagnosed with IBS, or have digestive symptoms, with no identifiable cause. Measurement of both hydrogen and methane (as opposed to hydrogen only) allows for the most accurate assessment of SIBO and carbohydrate malabsorption. Hydrogen/methane breath test using lactulose-only as a test mixture is more affordable (compared to lactulose and glucose test mixtures), and although slightly less sensitive, more reliably assesses the entire length of the small intestine. Testing for fructose malabsorption may be considered if suffering from severe IBS symptoms. This test is non-invasive, conducted at home, and requires up to three hours to complete. Simrén M, Stotzer PO. Use and abuse of hydrogen breath tests. Gut. 2006;55(3):297-303. Available at: https://www.ncbi.nlm.nih.gov/pmc/articles/PMC1856094/. Mayo Clinic [Internet]. Irritable bowel syndrome. [cited 2018 Nov 23]. Available at: https://www.mayoclinic.org/diseases-conditions/irritable-bowel-syndrome/symptoms-causes/syc-20360016. Rezaie A, Buresi M, Lembo A et al. Hydrogen and methane-based breath testing in gastrointestinal disorders: the North American consensus. Am J Gastroenterol. 2017;112(5):775-784. Available at: https://www.ncbi.nlm.nih.gov/pmc/articles/PMC5418558/. Ghoshal UC. How to interpret hydrogen breath tests. J Neurogastroenterol Motil. 2011;17(3):312-7. Available at: https://www.ncbi.nlm.nih.gov/pmc/articles/PMC3155069/. deLacy Costello BP, Ledochowski M, Ratcliffe NM. The importance of methane breath testing: a review. J Breath Res. 2013 Jun;7(2):024001. doin:10.1088/1752-7155/7/2/024001. BioHealth Laboratory [Internet]. Small intestinal bacterial overgrowth (SIBO) breath testing. [cited 2018 Nov 23]. Available at: https://www.biohealthlab.com/test-menu/sibo/. Siebecker A, Sandburg-Lewis S. SIBO: the finer points of diagnosis, test interpretation, and treatment. Naturopathic Doctor News and Review [Internet]. 2014 Jan 7 [cited 2018 Nov 23]. Available at: https://ndnr.com/gastrointestinal/sibo/.